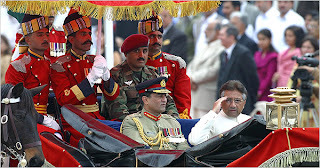 Pakistan's Supreme Court has ruled by a 6-3 margin that President General Pervez Musharraf may contest next month's the presidential election without first relinquishing his role as army chief of staff. The President General had promised to comply with the restriction by resigning his army post if he wins the presidential election (but not otherwise). 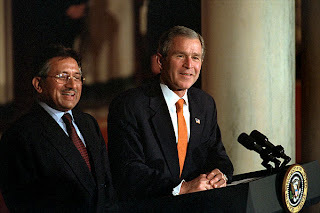 As I have pointed out in a previous post, Musharraf's American advisers like elections, but they don't insist that the elections be free and fair, so the chance of the President General losing this very stacked election appears as slim at this point as the chance that he will actually be forced to resign his Army commission after he wins the election. This is what one would call a triumph of justice and a victory for the electoral process, or just another giant leap forward in Pakistan's impregnable fortress of democracy. ISLAMABAD, Sept 28 (APP):- The Supreme Court Friday dismissed a set of constitutional petitions against the holding of two offices by President General Pervez Musharraf, clearing the way for him to contest the forthcoming presidential election in uniform. A nine-member bench ruled by majority of six to three that the petitions were not maintainable under Article 184 (3) of the Constitution, which relates to matters of public importance. The head of the bench Justice Rana Bhagwandas and two other judges, Justice Sardar Muhammad Raza Khan and Justice Mian Shakirullah Jan, dissented with the majority and held the petitions maintainable. Six other members of the bench -- Justice Javed Iqbal, Justice Abdul Hameed Dogar, Justice Muhammad Nawaz Abbasi, Justice Faqir Muhammad Khokhar, Justice Falak Sher and Justice M. Javed Buttar -- held the petitions to be “not maintainable” under Article 184 (3) of the Constitution. 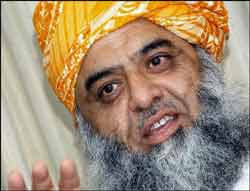 The petitions were filed by Jamaat-i-Islami, its Ameer Qazi Hussain Ahmed, Imran Khan and Pakistan Lawyers Forum. “For reasons to be recorded later, as per majority view of 6:3, these petitions are held to be not maintainable within contemplation of Article 184 (3) of the Constitution,” the order said. The nine-member bench was constituted by Chief Justice Iftikhar Mohammad Chaudhry. The bench heard the case for two weeks during which counsels from both sides presented their arguments and the President's counsel Sharifuddin Pirzada submitted a short statement in which the President pledged that if re-elected he would doff the uniform before taking oath for new term. The constitutional petition of Dr Anwarul Haq was disallowed to the extent of seeking permission to contest the election to the office of President. The decision is a triumph for justice, according to its chief beneficiary. For reasons to be recorded later. Yeah, sure! That's good enough for me!! 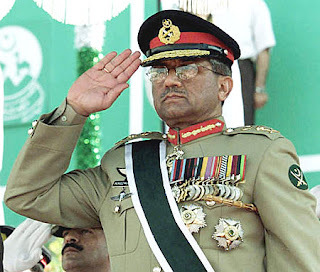 ISLAMABAD, Sept 28 (AFP) - Pakistani President Pervez Musharraf and Prime Minister Shaukat Aziz on Friday hailed a Supreme Court ruling that enables Musharraf stand for re-election next week while remaining army chief. “Justice triumphs. The president respects and honours the judgment of the supreme court, as always,” Musharraf's spokesman, Major General Rashid Qureshi, said. “Today Pakistan has crossed an important, indeed critical milestone in its march towards true democracy,” premier Aziz said in a statement. The Supreme Court is none too pleased about the deportation of former prime minister Nawaz Sharif. 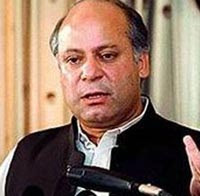 ISLAMABAD, Sep 28 (APP): The Supreme Court Friday issued notices to 13 respondents of the federation including prime minister Shaukat Aziz over a petition against the recent deportation of Nawaz Sharif to Jeddah. The four-member bench headed by Chief Justice Iftikhar Mohammad Chaudhry heard Fakharuddin G Ibrahim, counsel for Nawaz Sharif, who sought initiation of contempt of court proceedings against the Federation. Nawaz Sharif's September 10 deportation was a “gross, audacious and atrocious act of contempt of the court,” he said and prayed that respondents should be directed to secure the safe return of Nawaz Sharif and produce him in the court. He said the matter was of utmost importance as elections were around the corner. The bench directed Chairman PIA Zafar Akram and Director General Civil Aviation Authority Rehmatullah to file complete report about the activities which took place at Islamabad airport on Sept 10, including arrival of Nawaz Sharif's from London, the airplane which deported him to Jeddah, and the authority which gave orders in this connection. It also directed Director General FIA Tariq Pervez to submit report whether an exit stamp on Nawaz Sharif's passport existed or not when he left the country. Notices were also issued to Secretary Interior, Chief Secretary Punjab, Chief Minister Punjab, Interior Minister, IG Punjab, Chairman NAB, DG NAB, DIG Police Rawalpindi, and DG Pak Rangers. The hearing was adjourned for October 17. Indeed the matter is indeed of utmost importance. And that's probably why the hearing is adjourned until after the election. But where's the leader of the opposition? ISLAMABAD, Sept 28 (APP): The leader of the Opposition in the National Assembly, Maulana Fazal-ur-Rehman Friday held talks with US Ambassador Anne W. Patterson in his chamber in the Parliament House and said that Pakistan wanted peace in Afghanistan in the interest of Pakistan. He was of the view that US should concentrate on economic and social sector development in Afghanistan and the Tribal Areas of Pakistan. Engagement of people in the process of talks and developmental activities was a must, he said and underlined the need for early evacuation of foreign troops from Afghanistan. The US Ambassador said that US wanted peace in Afghanistan and to leave the country as soon as peace was established there. “We want to develop Afghanistan and continue economic development activities only”, she said. She said that US has very positive image about Islam and any evil talk about Islam hurts us very much. It's hard to imagine how much worse all this would be if not for the US and its very positive image of Islam.